Somehow in the last 45+ years we’ve traded our youth for wisdom and wrinkles; for the joy of children and grandchildren; and for the inner peace that comes with time and knowing oneself. How did the years pass so quickly??? Is It Time To Update Your Page? Do you have something you'd like to share with the class, photos, a new email or mailing address, phone number? We hope you'll use the Input Form or send your info to us via the email shown on the Input Form page. 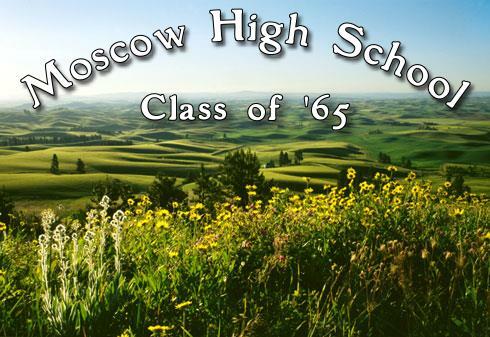 The Moscow High School, Class of 1965 had a great 45th Reunion! Soon, we hope to have photographs, slideshows, etc. on the Reunion Page. CLICK HERE to see the faces of those that attended the 45th! CLICK HERE to see the faces of those that attended the 40th! We would still love to find ALL of the classmates. Maybe, if we pass the word about this web site (www.MHS1965.com), they'll find us. (MISSING INFO).